← Could we all be better at Twitter? 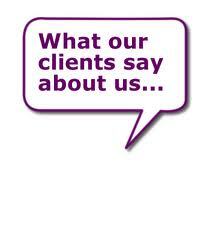 We read testimonials on websites and in social media forums and give others comments for their social media profiles. But maybe some of us are too shy to ask our own clients for the same recommendations. At M3 Media Publishing we tell our clients not to stay quiet about their achievements. They need to tell their stories through blogs and social media forums – and we’ll do that for them through our digital property magazines and HR magazines every week. If you’ve done a good job for a client, or if someone that has seen you in action has commented how well you did, then act quickly and get them to put pen to paper – or rather, fingers to the keyboard! I appreciate all those who have said them and am delighted they have sent them to me so I’d like to say: Thanks to you all! (I have also included links to everyone’s website where possible) and check these out! And don’t forget, these testimonials are vital to your social media profiles such as Linkedin. This entry was posted in Blogging, Marketing, PR & Media, Social Media Marketing and tagged David Lomas, M3 Publishing, Manchester, social media, social media marketing, testimonials. Bookmark the permalink.